Bras: What is Sister Sizing? I have a lot of siblings. Six brothers and one sister, actually. Having a sister is great sometimes. Sisters know you to the core, support you, share their clothes, and tag you in “only we will get this” memes on Instagram. And while sisters can be very similar, they are also very different. My sister and I are actually stepsisters. And while we call each other “sister” (no, really. When we address each other on cards and on the phone, it’s just as “sister”), we really have a lot in common and a lot of differences. The same goes for “sister sizing” when it comes to bras. I’ve been teaching women about bras and bra fitting for years – since 2005! And one of the things that still surprises me is that many women are still surprised about how bra sizing works. The concept of “sister sizing” seems simple, and is really important to understand. It’s a bra sizing concept that you’ll use to adjust your size, try different bras, and find a well fitting, comfortable bra. “Sister Sizing” is the name that the lingerie and bra fitting industry use to discuss similar bra sizes with different bra band sizes. They are “related”, if you will. Usually, calculating your “sister size” is the result of changing the band size, which then affects the cup size. Knowing how “sister sizing” works is helpful when you are trying on bras. This basic knowledge will help you change bra band sizes and know how to adjust the cup size in order to get the fit you’re looking for. Here’s an example: Let’s say you are trying on a bra in size 32C and wanted to adjust the band for a better fit. If the 32 is too tight, you’d adjust the band up to a 34. If the band is too loose, you’d adjust the band down to a 30. Seems simple, right? But what would you do with that “C” cup? Keep reading! How does Sister Sizing work? Okay so let’s dive in. Did you know that a cup size is relative to the band size? That means that a C cup, for example, is not the same volume, or “size” across different bra bands, like a 30, 32, and 34 band. If you’ve ever met someone who wears a 40C and someone who wears a 32C, for example, you may have noticed that the woman wearing a 40C has a noticeably fuller bust than that of a woman who wears a 32C. That’s because the cup volume for each cup size adjusts with the band size. The cup size volume is one cup size fuller for each bigger band size. So not only is a woman who wears a 40C wearing a band size that is larger, that C cup that she is wearing is bigger, too. It’s all relative to the band size. 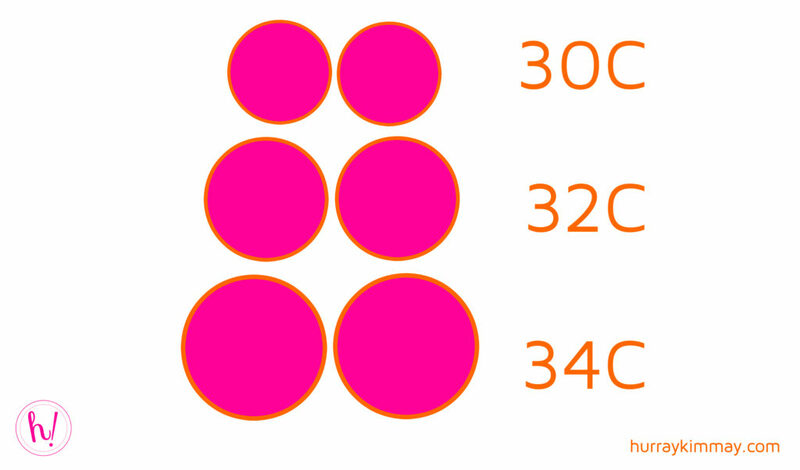 A 32C is one cup size bigger than a 30C. A 32C is one cup size smaller than a 34C. That also means a 34 is two cup sizes bigger than a 30C, and so on. A 30D is the same cup size as a 32C, or a 34B… and so on. The difference here is the band size, or length of the band. (And possibly how the cups are placed on the band. They tend to be spread further apart as the band gets bigger, typically). The cup volume remains the same. The basic rule to remember is “up in the band, down in the cup” or “down in the band, up in the cup” to keep the same cup size volume. That means if you adjust your band size up one (from 32 to 34, for example), you’ll need to adjust your cup down one size (from C to B, for example) to get the same cup size volume. Or, if you’re adjusting your band size down one (from a 32 to 30, for example) then you’ll adjust your cup size up (from C to D, for example) to get the same cup size volume. If you want to adjust your band size AND cup size up one each, you’d go up one in the band (32 to 34, for example) and keep the cup size the same (C to C, for example). 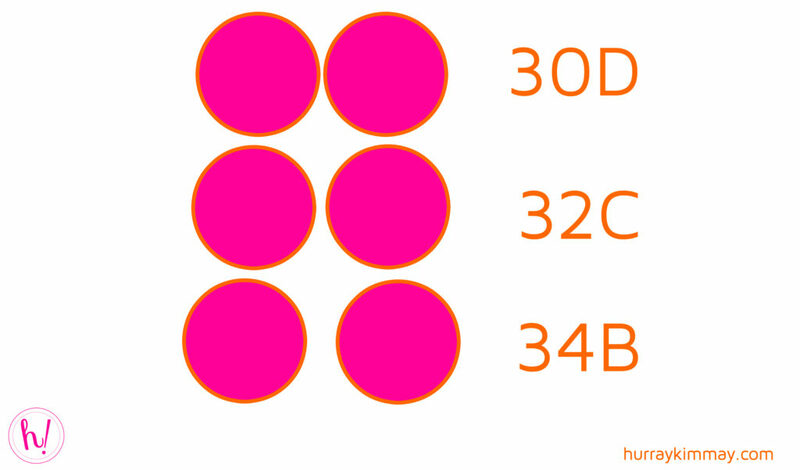 If you want to adjust your band size AND cup size down one each, you’d go down one in the band (32 to 30, for example) and keep the cup size the same (C to C, for example). The purpose of this post is to introduce the concept of “sister sizing” and help you navigate your next bra shopping experience with greater ease. Hurray! So I want to touch lightly on how the simple concept of “sister sizing” can get a bit complicated. As I mentioned in a previous blog post on Why 9 Different Bra Sizes All Fit, the world of bra fitting is not standardized or an exact science. The manner in which bras are sized changes across brands, styles, and countries. The good news is that due to the way bra patterns are made, the concept of “sister sizing” is safely applicable to most bra sizing methods in the world. In other words, whether you are shopping a brand from the UK, France, or the USA, if you’re adjusting your bra size in the same exact bra style, you can safely adjust your band and cup using the method above with a great deal of accuracy. Hurray! However, once you start to adjust your cup across brands and styles it can get tricky. That’s why it’s good to use this method as a rule of thumb, but keep in mind that assessing the fit of your bra is the most important step toward finding a fit that fits YOU best. Once I explain how “sister sizing” works, my bra fitting clients often say “Oh, great! Since I was measured for a 30D, that means I can buy a 32C or a 34B and wear that, too!” And while, technically that cup size will fit, that doesn’t mean a bra in one of her “sister sizes” is going to be the best fit. In my Top Five Bra Fit Tips, I explain how to tell if your bra fits, and that having a snug bra band is #1 on the list. Never sacrifice a good fit! A bra that fits well, feels comfortable, and looks great can give you the confidence to take on the world. A bra that fits well is a great way to say hurray inside, outside, and underneath™. If you find a bra in a “sister size”, and it isn’t the best fit for you, skip it. There is no need to settle. And if a bra fitter or salesperson suggests that the “sister size” is “the same thing”, keep in mind how actual sisters are. They may be similar, but they are not “the same”. And while one is not better than the other, it is very possible that – when it comes to bras – one is a better fit for you than another. “Sister sizing” is a helpful concept to know when it comes to finding a bra that fits well and feels great. And, it’s an important reminder that numbers are information, not a definition. That’s why I created the #MoreThanMyNumbers project (coming soon!) Because knowing your bra size starting point and your “sister sizes” is helpful information, but you are so much more than the size on a tag or any other number. Your Turn: What are your bra size starting points? Have you ever heard of the “sister size” concept? How can you apply this knowledge to your next bra shopping trip? What questions do you have for me? Leave a comment below and share your findings with us! I’m so glad that you found this helpful! You may find this Find Your Bra Size Starting point article helpful, too: https://hurraykimmay.com/brasize/ Plus, there are a few more helpful resources on that page to help you. Calculators are one tool, but they may not tell you the whole story. Here to help! THANK you so much. I can’t believe I’m 34 and for the 1rst time I know about all of this incredible info. Wearing the wrong bra since I was 12 ???? Generations and generation of women in my life without this knowledge. I’m sharing this to everyone. Definitely numbers can’t define us. In the past two years I have been put into four different bra sizes and I don’t think I’ve changed that much! This was a good read as I’m trying to find a perfect fitting bra. Does the bra you’re wearing eliminate gapping since it seems to cover up more with the lace band? This is my biggest issue with bras. Thanks! Hi there Francine! So glad you tuned in to Rachael Ray and want to try the Warner’s Play it Cool bra. They are super cool 😉 The perforated cups and wicking material are great. AND it’s SUPER important to make sure you’re wearing the right size. According to your measurements alone (which are just a starting point), you may find a 38G or 40F/DDD a great place to start. The Warner’s Play it Cool collections mostly fit up to a D or DD cup. This style from Olga, their sister company, is wire free and features their Chill-Fx™ moisture wicking material. Keep in mind a great fit is a great way to feel comfortable and cool – mostly because your bra will stay in place and won’t cause friction, and your band will do the heavy lifting – keeping your bust lifted and off of your torso. I hope that helps! Hi, great read! Victoria’s Secret measured me as a 32 double D but since they did not have a bra in that size put me in a 34D which has always worked. Now I am shopping for a bathing suit online and I love the suits quality. However I am noticing that the bathing suit tops gap a bit. One of the suits gaps underneath my breasts and the other suit gaps around the sides under the armpit at the top of the breast. It’s a pain because I’m going to have to return the two bathing suit tops and wait for them to ship me the correct size back. I am contemplating having them send me a 32 double D but I’m not sure? Since the suits gap a bit wouldn’t I want to lower the band & increSe the cup up one? So what do you do if you measure at a 40 but your cup size is smaller? I had been wearing a 38B but the band seems tight. If I go up to a 40, it’s hard to find a cup size smaller than C which I am assuming will be too big. I would usually wear a 40c comfortably but recently lost alot of weight, so now that doesn’t fit in the band or the cup(basically falls). I tried a 38c since its a size down and it was too tight. What size should I try? Its so frustrating sometimes! Hi Allison! Great question 🙂 Remember that a 40C is both a band size AND cup size smaller than a 40C. Also, your 40C may have been stretched out, so a 38 will suddenly feel very tight. Add in that every brand and style fits differently – so if you tried a new size in a different style or brand than you were wearing before, it may be very different. I suggest checking in on your size and using my fit tips to check the fit. Losing weight can totally change your size! 1. Your body is beautiful. No need to photoshop! Good for you. 2. I might find this somewhere else on this blog, but I notice that your band is so snug that it would show beneath a fitted shirt. I don’t know why (maybe too many bra snapping incidents when I was in middle school), but it really bothers me when people can see where my bra band is. If that’s indeed how snug our band should be, do you have any suggestions for having it look smoother beneath your clothing? Hi Jen! Thanks so much – bodies are beautiful, aren’t they? And great question! I get this one a lot 😉 The thing with a bra band is that it provides about 90% of the bra’s support. Or at least quite a bit. So having it snug enough to hug your body and stay in place = a good fit and lots of support. The thing is you and me and that person over there are not made of steel. SOOOO when you have elastic hugging your body, and you’re not made of steel, it’s totally normal to have some overhang and squishing. Of course, if it’s so tight that it’s digging in or you can’t breathe, PLEASE loosen up. One other thing to consider is wearing a bra band that is wider and seam free or flat – that will provide a smoother look. I hope this helps! Awesome article!!!! Kimmay, I have 4 sister and were all kind of different!!! Thank you again for the information.